Four and a half years ago, parishioners in the Archdiocese of Louisville began a journey intended to strengthen their understanding of the Catholic faith through a program called Why Catholic? Since that time, there have been nine seasons of Why Catholic?, which have coincided with the liturgical seasons of Advent and Lent. Sal Della Bella, director of evangelization for the Archdiocese of Louisville, reported that more than 90 percent of the 111 parishes in the archdiocese have participated in the program, sponsored by RENEW International. And countless small faith-sharing groups formed during that time to study, learn and share their faith. For four and a half years, members of these Why Catholic? groups across the archdiocese have share life’s ups and downs with one another. Brenda Bush, a parishioner of St. James Church in Elizabethtown, Ky., has been involved with Why Catholic? from the start and has been involved in other RENEW programs dating back to the early 1990s. “Members became more than strangers who attended the same church. Because many had shared their life stories — their successes and joys and sorrows — when we attended Mass it was truly more of a family gathering,” Bush noted in an email. Bush shared a story of one group member, Corby Powers, who was not Catholic initially but attended the small faith-sharing sessions with his wife, Barbara, who is Catholic. Bush recalled that Corby Powers said he had always been interested in the Catholic Church and may one day join. The group also prayed with the couple as Corby underwent treatment for cancer. He later died. Catholic Church while he was in the hospital in Louisville. There, he received the sacraments and was anointed,” Bush said. For Bush, her group’s interactions with the Powers remain a powerful memory. “Barbara was able to share with us at our closing session of Why Catholic? what that time meant to the both of them, and how — since his death — she has felt the love and support and prayers of this group,” Bush said. Della Bella said it’s not often that one ministry or program is able to reach most parishes in the 24 counties of the archdiocese. But, he said, RENEW and Why Catholic? did just that. Now that the program has come to a close, Della Bella said, the goal is to sustain the groups and encourage new faith-sharing groups to form. 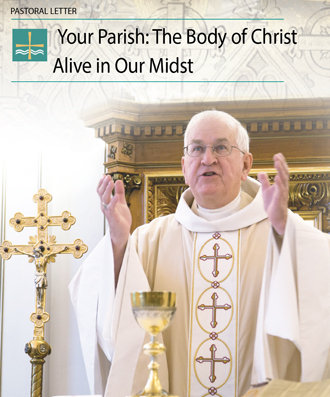 In order to foster this, the archdiocesan Office of Lifelong Formation and Education has created a variety of resources for small groups, including guides for Bible study, discussion topics and catechetical resources, such as Father Robert Barron’s “Catholicism” series, he said. Della Bella said surveys completed at the end of Why Catholic? show support for continuing with some type of small faith-sharing group. Of the 80 percent of parishes that responded to the survey, 77 percent indicated their small groups would continue to meet. Patsy Clements, a parishioner of Holy Trinity Church in Fredericktown, Ky., served as her small group’s leader and said she learned a great deal from the participants. “As far as I was concerned, it was a learning process to hear what other people thought,” she said in a phone interview. Visit www.archlou.org/ongoing-programs/whycatholic/, to view small-group resources. Small groups are also welcome to call the OLFE office at 448-8581 or the evangelization office at 585-3291, for additional support.